Rajasthan Jat Mahasabha issue statement on Bainsla's Remark. Gujjar agitation leader Kirori Singh Bainsla’s recenet remark could leads to Jat- Gujjar Clash in Rajasthan. Yesterday Bainsla told reporter that “The government should make up the 5% quota demanded by Gujjars by drawing 4% from the OBC category,”. Gujjar leader Kirori Singh Bainsla’s statement that his community’s quota demand be met by digging out 4% from the OBC’s 21% quota has irked the Jats, who are a major beneficiary of the reservation under this category. 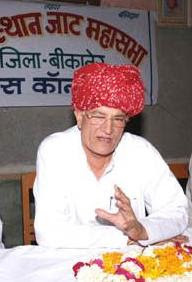 Soon after the Rajasthan high court extended the stay on 5% quota for Gujjars and three other communities for a year on Wednesday, Bainsla demanded that the state government should pull out the share of Gujjars—which he thinks is 4%—from the OBC and club it with the 1% quota given to the community as special backward class (SBC) in May this year. 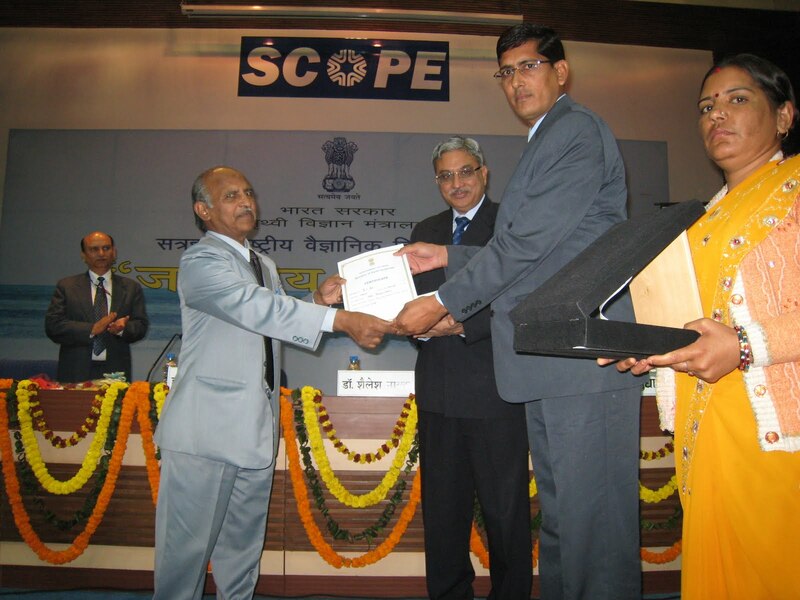 Shantanu Kumar possessed a rare multi-faceted personality with great expertise in ornithology, a state-level basketball player and a successful IPS officer, who went on to become DGP of Rajasthan. His early life started under the tutelage of his father Laxman Singh, who also served Rajasthan Police, in then biodiversity rich Keoladeo forest in Karauli district. Shantanu Kumar was an IPS officer of Rajasthan who rose to become the DGP of the State Police. Hails from Bharatpur district from village Jaghina. He was born in Bhagaur Jat Gotra. Married into a well-known family of Hissar district in Haryana. Had two sons, Sidharth whos passed away some years ago and Hemant Singh. Both were educated at St. Stephen's College, Delhi. He was a gem of a person and thorough gentleman. 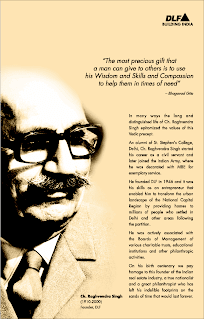 Shantanu Kumar truly represented the Bharatpur state known for brave and unhindered fighter rulers like Surajmal. Though he did not descend directly from the ruling family of this Jat kingdom, by virtue of his education and time-taught experiences, he was the best among all who hailed from Bharatpur. Only K Natwar Singh, a cousin, overshadowed him. He was a true nature lover and shared his knowledge of birds and animals with utmost joy with nature lovers and often compared the rich past with the present poverty. Saina Nehwal has regained World Number Two rank. According to the latest rankings released by the Badminton World Federation yesterday she is world number 2. Before Saina clinched her third Super Series title of the year at the Hong Kong Open in Wanchai last week, she was at number four spot. A strong performance at the Malaysian and Korea Super Series next year may help Saina grab number one spot. A person availing reservation in state jobs on grounds of being a "backward" cannot claim the same privilege in the Centre unless declared so by the Union government as well, the Central Administrative Tribunal has ruled. The tribunal passed the order on a petition by four members of the Jat community, recognised as Other Backward Class (OBC) in state of Delhi and seeking quota benefits for appointment as lower division clerks (LDCs) in the Employees State Insurance Corporation Limited , a Central government firm. They reported for duty after clearing the selection process, but were not allowed to join on the ground that they did not figure as OBC in the Central government list and were not entitled to quota benefits. The petitioners pleaded before the tribunal that the selection was to be made for Delhi region so the OBC candidates belonging to Delhi and coming under the OBC list of the state should be considered for appointment. The tribunal, however, refused to grant any relief to them and dismissed their petitions. 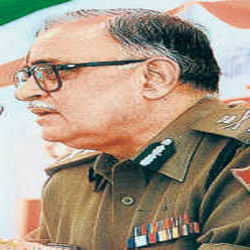 Dr. Harvir Singh Nehwal was born in a Jat family in Hisar, Haryana. Indian badminton star Saina Nehwal's father Dr. Harvir Singh is a scientist at the Directorate of Oilseeds Research, Hyderabad and her mother Usha Nehwal is housewife, both of whom were former badminton champions in Haryana. Sharing experience of childhood of saina he says Saina was such a sweet child that all our friends and family fondly called her "Steffi" and she was a very active child always interested in sporty activities. Saina's naughtiest phase was when she was 4 to 5 years old. In Hissar, where we stayed, there were lots of monkeys and Saina was so daring that she would scare the poor monkeys by running after them. In December 1998, Harvir Singh took saina to meet Coach Nani Prasad at the Lal Bahadur Stadium in Hyderabad. Seeing potential in the girl, Prasad asked Singh to enroll Saina as a summer trainee. Harvir Singh and Saina, who was 8 yrs old at the time, would wake up at 6 every morning and head to the stadium which was 20 km away. After two hours of practice, Singh would drop Saina to school on his way to work. Saina would often fall asleep on these journeys which prompted her mother to accompany them for the next three months. Traveling nearly 50 km a day in order to accommodate the training schedule, Singh eventually decided to move closer to the stadium in 1999. This however didn’t end the traveling ordeal as Saina was asked to attend evening training sessions as well. With the extra training sessions, traveling expenditure rose phenomenally. Added to the cost of equipment including shuttles, rackets, shoes, gutting and expenses rose to over Rs. 12,000 per month. In order to keep up with the rising cost of her training, Saina’s father withdrew money from his savings and provident fund. The tight-rope walk continued until 2002, when sports brand Yonex offered to sponsor Saina’s kit. As her status and rankings improved, the sponsorships increased. India's ace shuttler and CWG gold medallist Saina Nehwal once said in TV interview that her birth was a big disappointment to her grandmother as she wanted a boy. But Sh. Harvir singh nehwal show that boy and girl child are same and didn't make any difference. He is real hero for Community, india and icon for generation ahead. Akhil Kumar is one of celebrity contestant on Jhalak Dikhla Jaa 4 on Sony Entertainment Television. Akhil Kumar is an Indian boxer who has won several international and national boxing awards. He practices an “Open Guarded” boxing style. 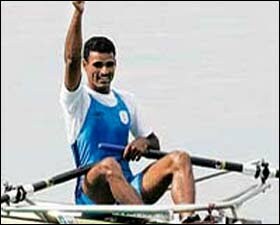 In 2005, the Indian government gave him the Arjuna Award for his achievements in international Boxing. The Arjuna Award is the highest recognition the Indian Government gives to sportsmen. 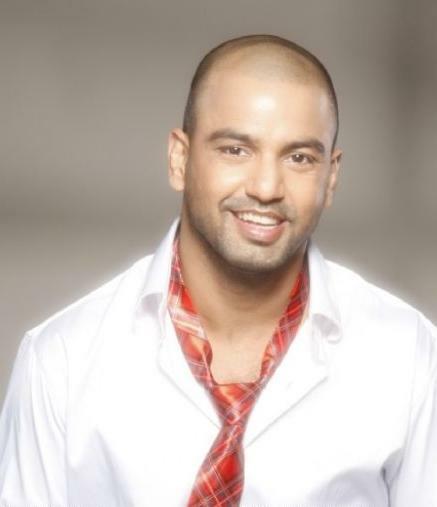 Akhil Kumar was born in Faizabad, Uttar Pradesh on 27 March 1981. He started boxing at 13. His first fight at “School State level Boxing” was in Haryana. Ace Indian shuttler Saina Nehwal rallied to register a scintilliating three-game victory over Shixian Wang of China to clinch her third Super Series title of the year at the Hong Kong Open in Wanchai on Sunday. The 20-year-old Indian capped her career's fourth Super Series title triumph with a 15-21 21-16 21-17 win over the 3rd seed Chinese in a gruelling one hour and 11 minutes summit clash at the Queen Elizabeth Stadium. The girl from Hyderabad won back-to-back titles -- Indian Open Grand Prix, Singapore Open Super Series and defended the Indonesian Super Series -- before clinching the gold medal in the Commonwealth Games in October here. Saina, who dropped to fourth in the world rankings, is likely to inch closer to the number one spot with this resounding victory. Saina played a tactical game after she lost the first game and clawed her way back with some fast-paced rallies and powerful smashes to outwit the Chinese world number 5. In the second game, Saina jumped to 11-5 from 5-5 but Shixian narrowed the gap to 11-10 before the gutsy Indian surged ahead to 19-11 by registering seven straight points. But Saina missed a couple of points on the baseline and nets to allow Shixian close the gap to 19-16. But with the Chinese hitting the shuttle out, Saina was back into the match. Indian Boxer Paramjeet Samota was born 5 July 1988 in a Jat family of Danaud village of Bhiwani district in Haryana. He won a gold medal in the Super heavyweight category at the 2010 Commonwealth Games. On 13 October 2010, in the finals of the event he defeated Tariq Abdul Haqq of Trinidad & Tobago 5-1. In the fifth Commonwealth Boxing Championships held in New Delhi from 10-18 March 2010, he along with five other fellow Indians won gold medal. He defeated New Zealand's Joseph Parker 7-3 in the finals. "I am very happy that my son has won gold medal for India. I want to thank the divine powers and his coach. My family, and my villagers, the whole district is very happy that Paramjeet has won gold and brought laurels to our village in Haryana state and for the whole nation," said Pradeep Singh, father of Paramjeet Samota. Almost every house in Danaud celebrated Paramjeet's victory by lighting lamps and bursting firecrackers.eople danced to the tune of drumbeats and visited the village temple to thank for Samota's victory. "We are very happy that he will come to the village with his gold medal. He has brought laurels to the academy and the entire village. We are really very happy," said Vikas, a friend of Paramjeet Samota. 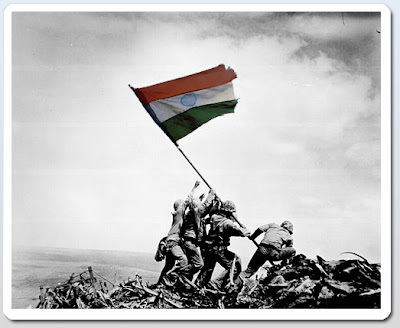 By Kanwarjeet Singh Virk. India Ace shuttler Saina Nehwal is turning out to be a hot property in the celebrity endorsement market after a string of successes this year, most notably the gold medal she secured in the recently concluded Commonwealth Games. One of Private Telecom operator is the latest in a series of corporates that have signed on the World No. 3 as a brand ambassador and Saina's endorsement value is understood to have reached the Rs. 1 crore per deal mark. "She is really in demand. A lot of companies want to associate with her. She has already signed up with telco and at least four firms operating in areas such as food and infrastructure will come on board very soon," Deccan Chargers Sporting Ventures Media Coordinator H Manjula said. Deccan Chargers Sporting Ventures handles Saina's account. Saina already endorses the Deccan Chronicle newspaper, Adani Wilmar's Fortune edible oil and Herbal life's nutritional product range. According to industry analysts, Saina, who was charging around Rs. 50 lakh per endorsement, is now able to command Rs. 1 crore per deal after her CWG win. The higher rate is also supported by Saina's hat-trick of wins at the Indian Open, Singapore Open and the Indonesia Open Super Series in June this year. The Akhil Bhartiya Jat Mahasabha(ABJM) on Friday submitted a memorandum to the Haryana government demanding the withdrawal of all cases registered against its members during the agitation for separate reservation for Jats last month. State ABJM president Om Prakash Mann, who led the delegation, said the demand for separate reservation would be raised again during the Jat Ekta rally to be held at Jind on December 5. The delegation also demanded allotment of one acre of land for construction of a memorial for Jat activist Sunil, who was killed in police firing in Mayyad village last month. India's Leading Hindi News Paper Dainik Bhaskar's Jaipur edition describe the Success story of Jat sportsman and tier-B Cities success story. Delhi president of Akhil Bhartiya Jat Arakshan Samiti Ran Singh Shaukeen today announced his resignation from the post. In a press statement released here, Shaukeen, claimed that he was fed up with the attitude of Samiti leaders, said "The Jat agitation had lost its true manner and in present circumstances it was not possible for me to hold the post. 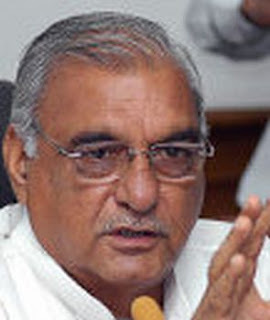 "Shaukeen alleged the national president Yashpal Malik, who had recently spearheaded the Jat reservation stir in Haryana and Haryana unit president Hawa Singh Sangwan had allegedly betrayed Jats in the name of Jat reservation agitation. He claimed that he had borne the entire expenditure of agitation during last three years. "I spent around 7-8 lakh rupees for three years including mass rally held at Jantar Mantar in Delhi on July 28 this year," the Jat leader said. When contacted, Sangwan said Shaukeen had been expelled from Samiti on September 14 due to his anti-Samiti statements. He also termed all allegations against Samiti leadership including against Malik as "baseless and false". India’s favourite hockey song Chak de and Dan dana dan from the film Goal are also played at all hockey matches. There is a roaring response to Jaaton ka chora jeet gaya at boxing matches as most puglists are from the Jat community. There are 50 athletes from Jat community in the Games, of which a remarkable 31 have won medals. The gold haul includes two shooting gold medals won by Harpreet Singh, a Jat Sikh. Seven Jat girls from Haryana and three Jat Sikh girls from Punjab have also added to the medals list. Two Haryana lads Paramjit Samota and Manoj – both Jats – have entered the boxing finals in their respective weight categories and are assured of at least a silver, thus taking the tally further up. After the victory of Indian hockey team against England on Tuesday, more Haryana athletes are assured of at least a silver medal. The Indian hockey team features four Haryana Jat boys – Sandeep Singh, Sardara Singh, Mandeep and Bharat. After the sensation victory against England last night, their fans back in their home state are hoping for a gold against the mighty Australians. Other prominent Jats include Sushil Kumar, the current world champion and the gold winner in the 66kg freestyle wrestling category and Mandeep and Manjeet Kaur who won the 4X400 metres relay last evening. Sociologists and researchers said Jats – Haryana’s dominant community – had always promoted traditional sports in rural areas including boxing, wrestling and kabaddi. CWG Diary - "All winners from India and also from Jat families"
Krishna Poonia’s gold was the first for India at the Commonwealth Games since Milkha Singh won the 440 yards race in 1958. After Australian world champion Dani Samuels cried off due to health and security fears, the Indian trio of Poonia, Harwant Kaur and Seema Antil were tipped to win at least two of the three medals. The three women are fierce rivals on the national circuit. Antil and Poonia aren’t the best of friends, especially after the former returned a positive test just after the 2006 Games. Poonia had then taken potshots at Antil, but today, no bad blood showed. As the packed house brought the roof down, Poonia shouted over the din to tell a reporter that that she was happy that all winners were from India. “And all from Jat families,” she added. And when Poonia couldn’t come up with a great answer when asked if she would have won the gold had Samuels been around, it was Antil who jumped to her defence. “Even if Dani Samuels had participated today, Krishna would have won,” she said. 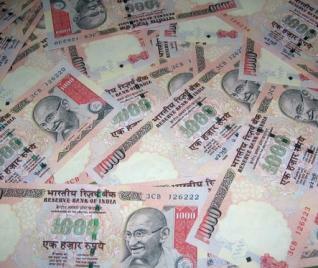 India is considered to be one of poorest country in world and specially the rural india. Spread across 650,000 villages, with an average population of 1,100, rural villagers were long imagined by city dwellers as primitive, impoverished and irrelevant, something to drive past on the way to something else. But Northern state Haryana is one of exception in this list. Haryana has the largest number of rural crorepatis in India. The Jat people are one of the most prosperous groups in India on a per-capita basis and Majority of population in haryana belongs to Jat community. Northern state of Haryana, rural dwellers are now nearly twice as likely to be crorepatis as city dwellers in Bangalore, the high-technology hub, according to the National Council for Applied Economic Research, the leading collector of data on rural India. 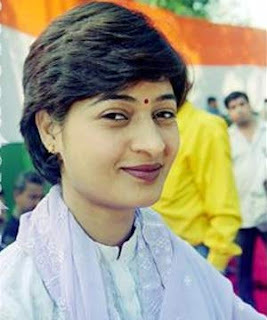 Ms. Alka Lamba was born on 21st September 1975 to Mr. Amar Nath Lamba and Mrs. Raj Kumari Lamba in New Delhi, India in Jat community. She always believed in Congress Ideology and later joined Indian National Congress and presently serving as a SECRETARY ALL INDIA CONGRESS COMMITTEE (AICC). In year 2002, she was appointed the General Secretary of All India Mahila Congress and for the next four years generously worked for the cause of women in India. In year 2003, she contested Delhi Assembly elections from Moti Nagar Constituency against the senior BJP leader n former CM of delhi-Shri Madan Lal Khurana. Contested 2003 Delhi Assembly Election against former CM of Delhi Shri Madan Lal Khurana. It was a historic day for Indian athletics and rajasthan on Monday as Krishna Poonia clinched the gold in the women's discus throw event at the Commonwealth Games in New Delhi. Krishna won the gold with a throw of 61.51 metres while Harwant got the silver with 60.16m. The bronze went to Seema with a throw of 58.46m. India swept the event with Harwant Kaur and national record holder Seema Antil also winning the silver and bronze respectively. Poonia's gold, which she won by throwing the discus to 61.51m, was the first gold after 'Flying Sikh' Milkha Singh's 440 yard race gold in the 1958 edition of the Games in Cardiff, Wales. Harwant came up with an effort of 60.61m, a tad below her season's best of 60.66m, while national record holder Seema Antil threw the discus to a distance of 58.46m. Sushil Kumar brought a spectacular end to India's campaign in wrestling by winning the 66 kg freestyle gold here Sunday. India finished with 10 gold, five silver and three bronze. Sushil gave a power-packed performance as he outclassed South African Heinrich Barnes, 7-0. As the bout ended, the overflowing stands broke into an impromptu jig to the tune of 'yeh desh hai veer jawano ka'. Congress president Sonia Gandhi, Delhi chief minister Sheila Dikshit and Commonwealth Games organising committee chairman Suresh Kalmadi were among the spectators cheering the Indian wrestlers. Apart from Sushil's gold, there was some disappointment on the final day of wrestling as Indians lost two other finals -- Anuj Kumar (84kg) and Joginder Kumar (120kg) -- and had to be content with silver. Anil Kumar got bronze in the 55kg event. Alka Tomar - once a world championship bronze medallist herself - showed great presence of mind and a solid defensive game to bring India gold in the 59kg freestyle women's wrestling on Friday. Then she put it all down to the champion in their midst. "After Sushil-bhai won gold at the Worlds, we all believe we can beat anyone," she said. Chances are very few heard what Alka Tomar said over the happy, racous din that she had helped kick off in the stands. It was an impromptu party, and everyone was invited. Music blared down from the Indira Gandhi Stadium stands - a noisy medley of bhangra and Bollywood. Fans were dancing, the mood was one of happy, deliriouspromise. It was one Anita showing up in the 67 kg title bout was determined not to ruin. She didn't, but first, Alka Tomar. “I chose to stay back in the village even though my entire family is in Delhi to see Alka perform at the Commonwealth Games as I did not have the courage to see her had she lost in the bout today. Agar haar jati to dekh na paata.” Alka’s father Nain Singh Tomar thus explained the reason for not being there with her daughter in her moment of glory. His blessings however bore fruit and she claimed a gold in the 59 kg freestyle category in wrestling by defeating an Olympic medallist in style. He has been distributing sweets to the neighbours and in fact the entire village is celebrating Alka’s triumph at the Games. Hundreds of villagers gathered around her home is Sisoli village, in Meerut and were dancing on the beats of dhols and nagaras. Khap Panchayat word is now days in every news channels, even some of TV Channel's Anchor who never moved out of A.C. CABIN in Mumbai/Delhi in whole life , are now giving verdict over one of oldest social organization khap panchayat and defaming jat community just to increase TRP of TV Show and today khap panchayat word look like a word from another planet. Recent incidents defame the image of khap panchayat and jat community people so its time when we must bring the truth whether wrong or right and use this 1000 years old platform for social reform. After all Khap panchayat's motive is to work for Community, it is not some SENA for social damage and burning nation. We must use khap panchayat or other social organization to bring major changes in society by bringing down social evils like child marriage, Mayara, Mrityu-Bhoj and other issues in jat community and make some major changes in Khap panchayat's traditional rules as per demand of time. We must use this platform for girl education, help financially if some one needed and bring awareness in public that today there is no difference between girl and boy. Related post: Raise voice against Khap panchayat IF WRONG ! Vijender Singh Beniwal or Vijender Singh is an Indian boxer from Kalwas village, Bhiwani district in Haryana. He belongs to a Hindu family of Jat ethnicity. Vijender’s early days were spent in his village where he did his schooling, after which he received a bachelor’s degree from a local college in Bhiwani. He practiced boxing at the Bhiwani Boxing Club where coach Jagdish Singh recognized his talent and encouraged him to take to professional boxing. Vijender went on to compete at the sub-junior nationals where he won a silver medal for two years in succession. Having won medals in different competitions at the national level, Vijender was picked to train and compete at several international level competitions such as the 2004 Athens Summer Olympics and the 2006 Commonwealth Games. At the 2006 Asian Games in Doha, he won the bronze medal after losing the semifinal bout against Kazakhstan's Bakhtiyar Artayev. At the 2008 Beijing Summer Olympics, he defeated Carlos Góngora of Ecuador 9–4 in the quarterfinals which guaranteed him a bronze medal — the first ever Olympic medal for an Indian boxer. Ranbir kapoor will pay role of jat in his next film 'Rockstar' with Imtiaz Ali. He is now days busy to promote his all set for release film, Raajneeti. Ranbir plays a member of a political family who gets sucked into politics “because of some dirty games”. His observations on Indian politics? “The youngsters in the country are definitely going to change things for the better. I have tremendous belief in the likes of Rahul Gandhi and Sachin Pilot. The little I know about politics is through the media. I have voted in the past two years. We have a great leader in Dr Manmohan Singh,” says Ranbir. He starts shooting for Rockstar by June-end. “I’m playing a Jat in it and hence, working on the diction. Congress MP from Kurukshetra Naveen Jindal on Monday supported the khap panchayats’ demand to amend the Hindu Marriage Act to ban unions within a gotra (sub-caste). Jats comprise 17 per cent of Kurukshetra’s population. But the Congress distanced itself from Jindal’s statement, saying in a democracy individuals are entitled to different opinions.Jindal received support from INLD chief OP Chautala who met Home Minister P Chidambaram to urge him to amend the act. “We are opposed to inter-caste marriages, which are not right scientifically and medically,” Chautala later said. But the Congress distanced itself from Jindal’s statement, saying in a democracy individuals are entitled to different opinions. “The Congress stand is crystal clear. No customary law or practice can possibly be excused or condoned in any manner if it involves killing of any kind in the name of honour, tradition or heritage,” he said. JOSF stands for jat officers social forum which is group of Jat Officcers from different domain can contact each other and share thought at common platform. JOSF members are from different region of country with different platform so JOSF is good platform to know people from out community at common platform. In a meeting of about 60 'Khap panchayats' held at Jind, haryana demanded amendments in the Hindu Marriage Act to prevent marriages within the same 'gotra' (clan) and village. The 'Sarv Jatiya Sarvkhap' mahapanchayat presided over by Mewa Singh, president of the Mor Khap, urged all the MPs and MLAs of the state to support the demand of the panchayats. The mahapanchayat decided that its representatives would meet the MPs and MLAs of the state and seek their cooperation for bringing amendments in the Hindu Marriage Act to bar marriages withing the same 'gotra', a provision absent in it at present. Earlier, during a meeting at Danoda Kalan village in Narwana sub-divison of Jind district on April 18, the panchayats had made the same demand, saying such marriages were against societal norms. A mahapanchayat of different khaps would now be held at Pai in Kaithal district on May 2, to decide the future strategy. Mamta Kharab (born January 26, 1982 in jat family, Haryana) is the current captain of the Indian women's hockey team. 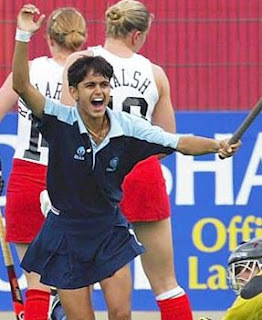 During the 2002 Commonwealth Games, she scored the winning goal which gave India the Gold. She also served as the model for the character of Komal Chautala in the 2007 Bollywood hit, Chak De India. She is a recipient of the Arjuna Award. Krishna Poonia is national woman discus throw champion of India. She won bronze medal in 2006 Doha Asian Games. She hails from Gagarwas village in Churu district in Rajasthan in India and represents Indian railways in national tournaments. Krishna Poonia threw the discus to 61.53, her personal best, in the second try and finished behind Aimin Sing of China (63.52) and Ma Xuenjun, also of China (62.43). Krishna Poonia had won gold medal in the 46th Open National athletics championships to nose ahead of favourites Seema Antil and Harwant Kaur while registering a career-best 60.10 metres distance. She contested at the 2008 Beijing Olympics, but failed to reach the finals, after finishing 10th in the qualifiers with a throw of 58.23 m.
Alka Tomar is wrestler who received the bronze medal in Wrestling (55 kg Freestyle) at the Doha Asian Games in 2006. Alka Tomar also received a bronze at the Senior Wrestling Championships in Guangzhou in China 2006. Alka tomar is National Women Wrestling champian of India. She was born in sisoli village in Meerut district in the state of uttar pradesh. She started wrestling at the age of 6. 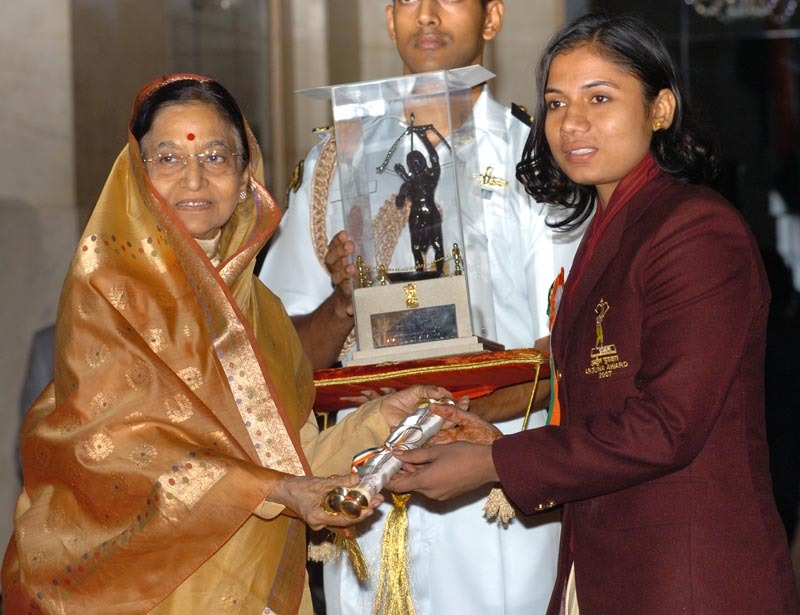 She is also a recipient of arjuna award 2007. Arjuna Award is India's leading award presented for Sports persons in India.